Show: Every Oct. 11, thousands of gay, lesbian, bisexual and transgender people and allies celebrate National Coming Out Day, a tradition which began On Oct. 11, 1987, when half a million people marched on Washington for gay and lesbian equality. In celebration of National Coming Out Day newly formed Charm City Kitty Club plumbs the shockingly rich diversity in Baltimore City and beyond to present a knock-out line-up of performance and music in a Cabaret-style in a new quarterly series at the Creative Alliance. Although music, performance and club environments abound for the dominate culture – straight, white, heterosexual. 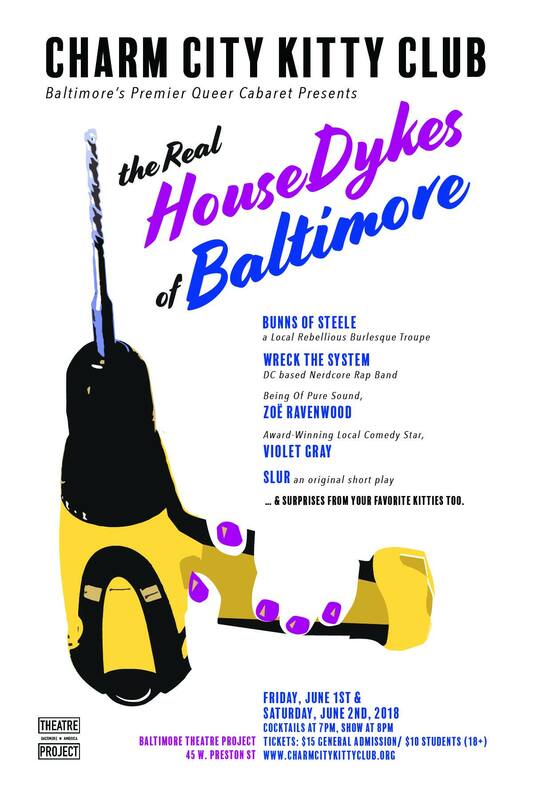 The Charm City Kitty Club carves out a unique social and cultural niche for lesbian, dyke, bisexual, transgender and transsexual women and all our allies. Linda is our “mixologist” for the night, providing her home-brewed dj mix for cocktail hour and intermissions. Liz performs a solo music/performance piece created custom for tonight. Bringing the beauty of Middle Eastern, Latin, and Asian dance combined with the rhythms of the clubhouse, Miasia’s tantalizing blending of international dance with music you know and love will you away. T. Cooper will be reading from her new book “Some of the Parts, with multi-media help from Baltimore’s Catherine Pancake. Explores life for youth in homophobic American in her video Accidental Insolence by retelling three “headline news” stories.